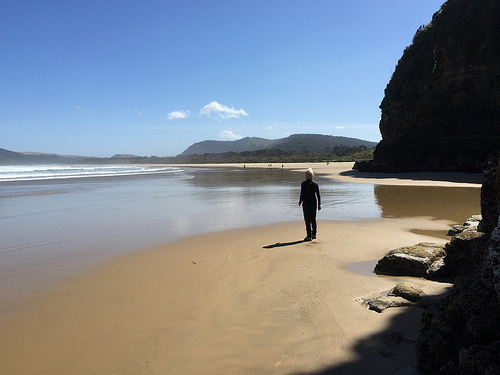 Travelling The Catlins Coastal scenic route New Zealand – what a trip! You’ll get to travel through a slice of beautiful untamed country – best described as unplugged! The Catlins represents the rural heartland of New Zealand in the lower South Island. What you’ll see, is a stunning rugged coastline. And if you want to see most photographed waterfall in the country, you will, by taking this route. After you leave the Otago town of Balclutha, you’ll slowly enter an untamed environment. In this area, the locals place great value on their personal freedom – the environment allows them to explore with absolute freedom. On a recent drive down here, we passed a deserted driftwood beach. 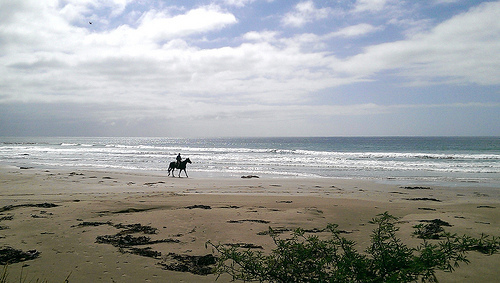 We stopped to watch the surf and saw a man and his horse silhouetted against the sun. We waved at each other. As you continue driving, you’ll soon arrive at Kaka. 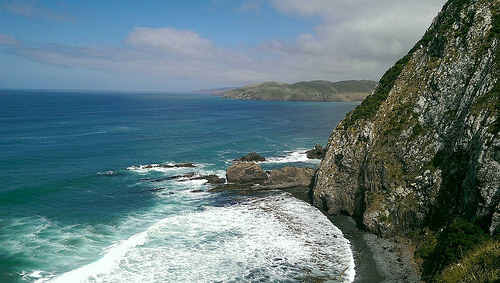 At this point, the drive will take you along a gravel road towards the very famous Nugget point. 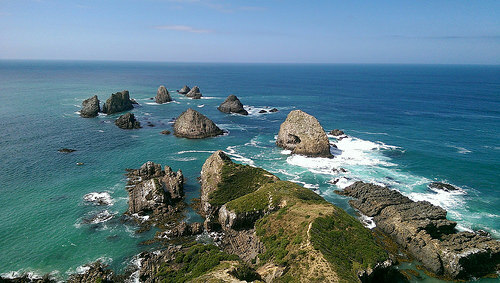 Nugget point is 23km from Kaka Point. 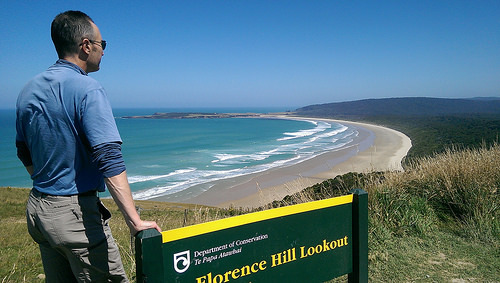 This is a must-do stop for travellers visiting The Catlins. From the Florence Hill Lookout, the views will take your breath away. 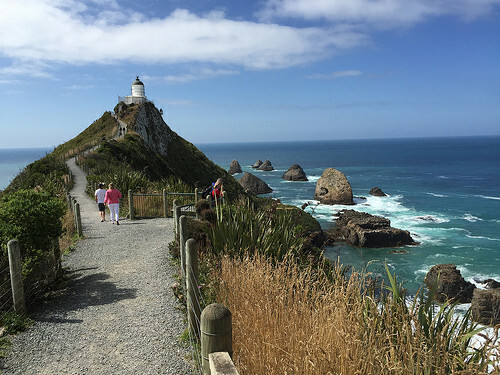 To view the lighthouse at Nugget Point park your vehicle in the large public carpark. The walk to the lighthouse will take you between 10 minutes. Now some of the walk is a bit challenging – its quite steep in place. But you can take your time and believe, the views are worth it! The great thing about the walk up, is that there are so many highlights along the way. All you have to do is look down onto the rocks below – you’ll see fur seals frolicking about and having the time of their lives. And you’ll get so much variety of birdlife – sooty shearwaters, shags, yellow-eyed penguins, spoonbills. You’ll even get to see a breeding colony of gannets. Okay, I guess by the time you get to The Caitlins, you’ve probably seen a lot fur seals. But it seems to me, that international visitors can’t get enough of them! Once you leave Nugget Point, your next stop will probably be at the small township of Owaka. Every country has their areas of eccentricity – where people do things a little differently. At Owaka, they are great collectors. You can’t miss the Owaka Teapot Collection. 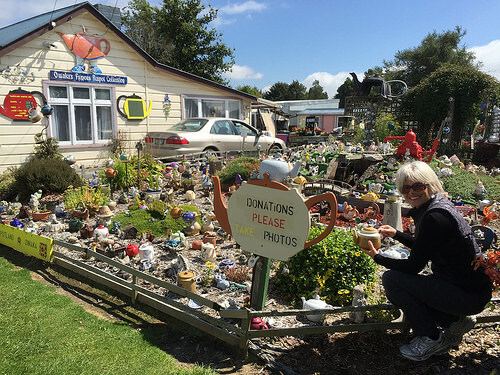 This is an iconic stop if you’re interested in teapots! Actually, its quite amazing the treasures you can find in places like this. Old and authentic collectibles. All you have to do, is walk down the main street. Found in most rural towns, are those small museums – they’re fascinating. The Owaka Museum is definitely worth a visit. Now if you’re stopping for something to eat in Owaka, don’t expect fancy culinary offerings. On the day we visited, the coffee was quite good – we chose to ignore the weird mountain of froth on top. 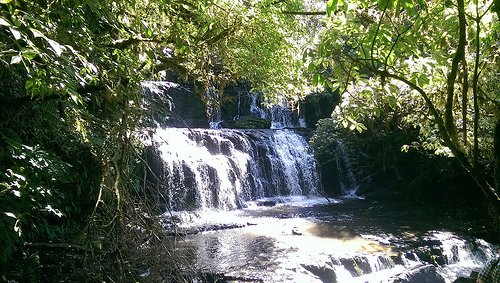 After stretching your legs at Owaka, you’ll probably head off see the Purakaunui Falls. Here, you’ll see the most photographed waterfall in New Zealand. Park your car at the carpark – make sure you lock it! There is a 10 min forest walk leading to the waterfall. The actual waterfall is a magnificent sight – masses of water cascading over 3 tiers of solid rock. Yet again, we see visitors, including New Zealanders, showing disrespect for a beautiful environment. We came across a father encouraging his adult son to scramble up the waterfall. With every stop, this guy was scraping away 20 years growth of lichen and moss. Sometimes we should just show restraint. There’s absolutely nothing wrong with just quietly viewing nature’s handiwork. 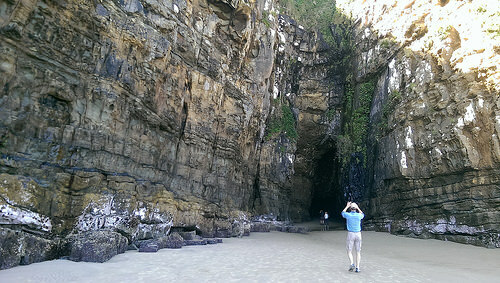 After the waterfall, drive on to the beautiful Cathedral Caves. 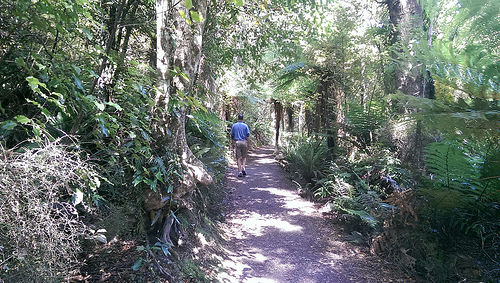 These caves are located on privately-owned Maori land, so there is a small entrance fee. This fee helps to maintain the road leading into the carpark. There is a 20 min walk through a podocarp and Kamahi forest. The forest walk suddenly opens out to reveal a beautiful beach. 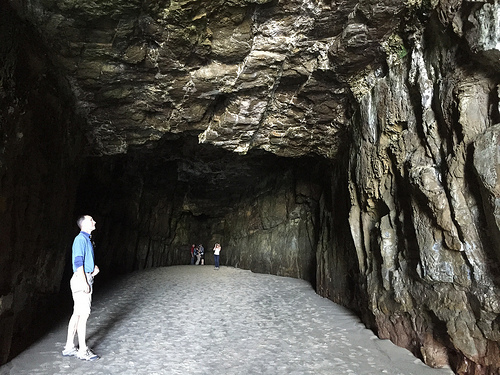 Even from a distance, the architectural magnificence of these caves will be obvious. The cave interior really does resemble a massive gothic cathedral. And the acoustics are perfect for an Italian aria. Most visitors cannot contain themselves. Human voices echo back and forth -some musical and others not quite so much. If you’re looking for accommodation in the Catlins, these are limited. But just around the corner from the Cathedral Caves, there is a place to stay that would suit variety of travellers. 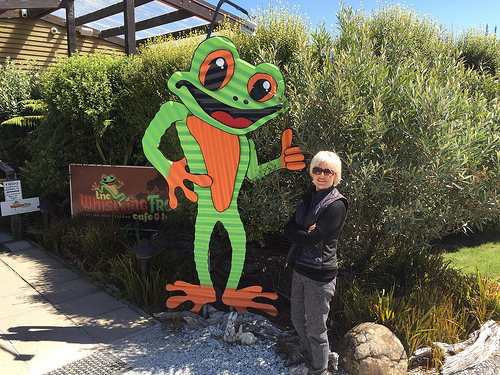 The Whistling Frog Café and Resort may have an eccentric name but the owners have put a lot of thought into creating something unique. What struck us, was the great sense of community it had. The Whistling Frog has small cabins and fully self-contained modern cottages. There is a good family restaurant on-site – plus there’s live music to relax by. There’s always plenty of thrilling moments along The Catlins Coastal scenic route New Zealand. Happy Travelling through the Catlins! 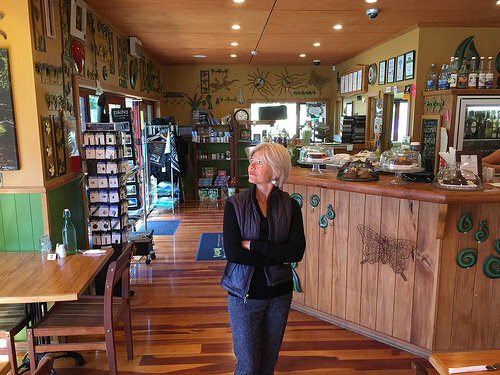 Love the Catlins and all it’s offerings – such a diverse landscape and love those little quirky cafes and treasures along the way. Agree whole heartly regarding people clambering over things they shouldn’t – ruing for future generations. Thankfully there aren’t too many people like that and we can enjoy the nature beauty for what it is – natural beauty. I did feel a real connection to this place, especially Riverton, where we stayed for 3 days – amazing and pretty much undiscovered by mainstream tourissm (maybe that’s a good thing). We think some of our customers would really love it. Takes a special person to enjoy a special place like this.